Personalized Daily living Voice Reminders. 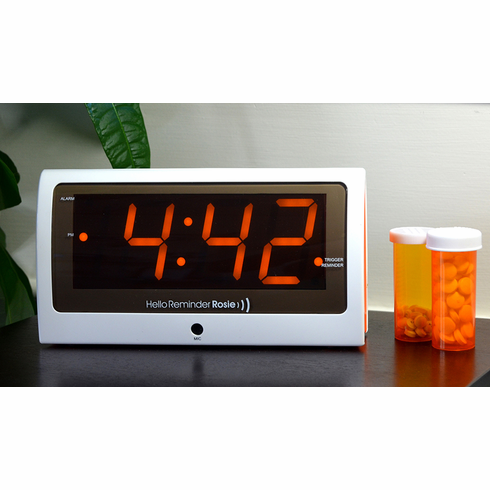 Avoid Medication Errors and Feel Better with this easy to use voice activated 25 alarm clock. You can easily record medication reminders - up to 25 per day- simply talk in your normal voice to the e-pill alarm clock and set the different alarms along with recorded reminders. The patient can also talk to the clock and ask it for the time and upcoming alarms. Loud Reminders repeat for 1 hour or until you say "Reminder off"
The loud pill reminder alarm is easy to hear and the time is shown on the large easy to read display with 2 inch large LED digits. This clock can make life a lot less stressful and offer loved ones increased safety independence. A family member or caregiver can record a reminder, such as "I love you mom, it's time to take two red & one white pill" at 8:30 am every day. Once the task is accomplished the person either says "reminder off" or touches Rosie to turn it off. Using revolutionary speech recognition technologies, the Talking Alarm Clock announces multiple loud personalized reminder alarms at specific times, daily, weekly, on a specific date, annually, in any language. The clock can also tell the time, date or "today's reminders" to help organize each day. This talking alarm clock provides a simple solution to help users remember medications, appointments, household tasks, social activities and other helpful information without touching any buttons. Alarm Duration: Medication Reminders sound for 60 minutes (1 hour). Wake up Alarm 7 minutes with 9 minutes snooze period. Conditions: 30-day Money Back Guarantee and a One Year Warranty by Manufacturer.